How can I add the Booking Button? To add a Booking Button, please follow the instructions below. Click the Channels / Booking Button in the upper menu of HotelRunner panel. Please click Buttons on the left hand menu. 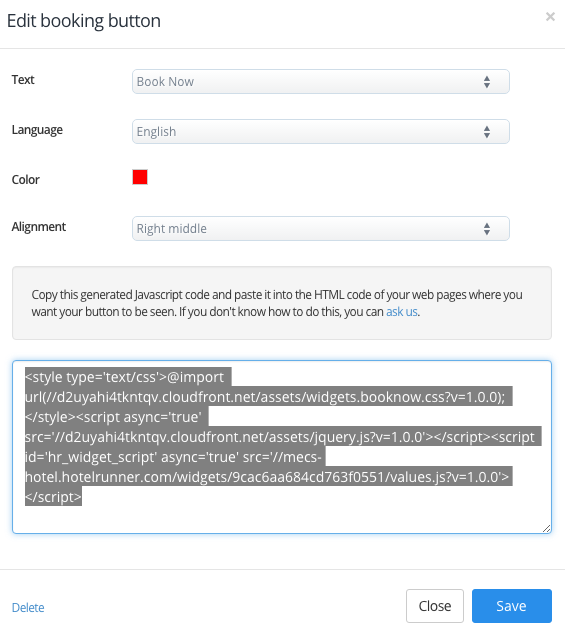 From the Text field, please choose the text you want generated on the Booking Button. After choosing the Color and Location for the Booking Button, please click Save. Please fully relay the appearing code block to your Website Administrator and ask them to place it on your website properly.